EXTORMITY, the first Seedie-certified EMR from the electronic health records mega-corporation dedicated to offering highly proprietary, difficult to customize and prohibitively expensive healthcare IT solutions. I became aware of these sites when I presented this week at the 2nd WorldVistA Educational Conference at Robert Morris University in Pittsburgh. VistA is the VA's home-grown (over a few decades) EMR system, and is EMR the way EMR would have gone if the "medical industrial IT complex" had not intervened. VistA's source code is free, as it was developed via taxpayer dollars, and is being modified for commercial environments. WorldVistA's version is already in use in a number of sites in the US and in other countries and is perhaps the 1994-phase "Linux" of the HIT world. A functional demo of VistA's Computerized Patient Record System (CPRS) is available, courtesy of the U.S. government here (PC only, unfortunately). I consider this growing open-source HIT movement fascinating. I believe that growing problems and dissatisfaction with commerical EMR's and more importantly, business IT culture as parodied in the Seedie/Extormity links above may seriously delay the spread of effective clinical IT, or even kill current enthusiasm for clinical IT altogether. I also believe the unimaginative, process over results, tightfisted control, bureacratic "data-processing" culture of the business IT (management information systems) world to be the lineal descendant of IBM's patchcord plug-panel programmed, card tabulating machines from which IBM made a large portion of their profit in the days before the electronic computer. You perhaps required such a culture when you were running huge businesses from stacks of tens of thousands of punched cards. However, such a model does not work well in meeting the information needs of clinical medicine. 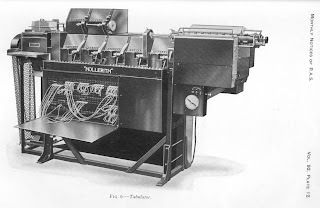 From The Tabulating Machine Company to IBM: [Census tabulating pioneer Herman] Hollerith's company, the Tabulating Machine Company, rented out machines to other customers both government (Austria, Canada, France, Russia) and private (New York Central RR, Marshall Fields, Penn Steel). The company was profitable but due to its policy of renting instead of selling machines, it had cash flow problems. The Tabulating Machine Company merged in 1911 with 3 other companies, International Time Recording Co, Bundy Manufacturing, and Computing Scale of America to become Computing Tabulating Recording Company. In 1924 its name was changed to International Business Machines - IBM. Hollerith Type III Tabulator with its programming panel exposed. Photo: MNRAS, Vol.92, No.7 (1932). Click to enlarge. Medical informatics, a pioneering field, in many ways saw the electronic computer not as a card-based data processing machine but as a canvas for development of creative works to serve the needs of clinical medicine and its practitioners. Severe delays in or abandonment of current HIT efforts due to expensive failures and lack of ROI would be a shame, because clinical IT at this point in time has finally attained the capability to provide the many benefits that have been promised about it for the past few decades - but only if done well -- and the definition of "well" in this context is a very long essay in itself. At best while not a panacea, at worst clinical IT can and does impair the quality of care if done poorly, and wastes significant capital and expense that healthcare can ill afford. Finally, my presentation at the WorldVista meeting entitled "Open Source and an End to Vendor Hegemony: Why This is Essential to HIT Success" is here (zipped Powerpoint). We recently commented on a New York Times article that revealed that Virginia Commonwealth University got a research grant from the tobacco company Philip Morris, a grant which gave proprietary control of any research results to the company, not the academic researcher, and required the grant itself to be secret. As a member of the board of directors of Universal Corp., Trani receives an annual retainer of $40,000, including stock options. He also receives a fee of $2,000 for each board of directors’ meeting he attends and another $1,500 for attending committee meetings. Actually, Style Weekly understated Trani's financial ties to Universal Tobacco. In fact, according to the company's 2007 proxy statement, in May, 2007, Mr Trani held 12,642 shares of company stock (including shares which he had the right to acquire via options within 60 days of May 25, 2007). His total director's compensation in 2007, including fees and stock options, was valued at $117,575. He held 6000 stock options valued at $41.88 per share (thus worth $251,280). Finally, his aggregate balance of his director's retirement plan was $321,740. Similarly, an editorialist for the Richmond Times Dispatch shrugged off this new development. However, in my humble opinion, it really is important. We have previously discussed conflicts of interest incurred when the leaders of health care organizations also serve on the board of pharmaceutical, biotechnology, medical device companies and the like. The issue goes beyond just the often generous payments board service entails. The important consideration is that directors of public for-profit corporations have a duty to "demonstrate unyielding loyalty to the company's shareholders" [Per Monks RAG, Minow N. Corporate Governance, 3rd edition. Malden, MA: Blackwell Publishing, 2004. P.200.] It would seem that the conflict created when the president of a university to whom a medical school and academic medical center report also is the director of, for example, a pharmaceutical company is obvious. I have not previously heard of case in which the leader to whom a medical school or academic medical center report who also leads a tobacco company. That of Mr Trani appears to be the first case reported of this worse variant of what we once called "a new species of conflicts of interest." It seems to me that the conflict created by this situation is much worse than that of, for example, a university president who also is on the board of a pharmaceutical corporation. At least pharmaceutical, biotechnology, and medical device companies make products that are intended to provide more benefit than harm to patients. Tobacco companies make products that increase the risk of severe medical problems, but provide no medical benefits. It does not seem ethical for a medical school or academic medical center to report to someone with a fiduciary duty to increase the profits of a company that facilitates the making of such products. Thus, Dr Trani's "being on the board" of Universal Corporation pertains most seriously to Virginia Commonwealth University, particularly to the VCU School of Medicine and VCU Medical Center. They ought not to be lead by someone with "unyielding loyalty" to the shareholders of a tobacco company. Typically in medical settings, patients are handed booklets called 'notice of privacy practices.' The documents explain the numerous ways patient information can be used, including fundraising to benefit the health care operation. When patients sign the statement, it's an acknowledgement that they've received the information. A Chronicle survey of a dozen Bay Area hospitals and medical centers found that the majority directly solicit current or former patients. When you go to Macy's or Wal-Mart or buy a car, it has come to be expected that your name will be used for commercial purposes. But it seems to me that physicians and hospitals have higher standards. People come to us ... because they are sick. They have an expectation that their names will be kept private, even the fact that they were treated by the doctor or hospital. I'm sure that the vast majority of patients are not aware that this is done. Few things in life make us feel as vulnerable as seeking help at a hospital. The patient's feelings of vulnerability, fear and anxiety are why the medical profession has historically held itself to the highest standards when it comes to protecting patient privacy - and why it is so outrageous to discover that hospitals and other health care organizations have been using patient information - without explicit permission - for fundraising purposes. In the corporate marketing world, deceptive practices are fuzzy, and most consumers are rightfully wary of registering at Web sites, giving their phone numbers to department store clerks and signing up for free contests. But a patient seeking medical care should not have to worry about the fine print of the forms required to get treatment. I have little to add, other than this seems to be another example of the adverse effects of running hospitals (and other health care organizations) like businesses rather than mission-oriented not-for-profit organizations, especially in an era when business ethics often seems like an oxymoron. Hospitals need leadership that put the mission of caring for patients ahead of the relentless pursuit of more money. Pharmacy-benefits manager Express Scripts Inc. agreed to pay $9.5 million to settle allegations that it asked doctors to switch drugs primarily so it could get bigger rebates from pharmaceutical companies. The move all but closes the books on a four-year investigation of practices at pharmacy-benefit managers, or PBMs. 'Today's settlement completes our effort to clean up the PBM industry,' Vermont Attorney General William Sorrell wrote in a release. Vermont, which gets a $372,000 cut, was one of the lead negotiators with the company. Fellow pharmacy-benefit managers Medco Health Solutions Inc. and CVS Caremark Corp. have already reached agreements with the states over similar issues. The agreement states that Express Scripts 'engaged in deceptive business practices by encouraging doctors to switch patients to different brand name prescription drugs and representing that the patients and/or health plans would save money,' according to the Vermont attorney general's office. Express Scripts told doctors that switching their patients to different cholesterol-lowering drugs would save money for patients and insurers, but they often saved little or incurred higher medical costs, [Connecticut Attorney General] Blumenthal said. Patients, for instance, might have had additional blood tests and doctor visits as a result of the drug-switching. This is first a reminder of the amazing complexity of the US health care system. Not only are there the major organizational players, but numerous middleman organizations that work in the interstices of the system. Pharmacy benefit managers (PBMs), for example, work in the interstices between patients and physicians, pharmacies, pharmaceutical companies, and managed care organizations and insurers. And it seems like each kind of organization may cultivate its own brand of deceptive practices. Note that Express Scripts is apparently the third PBM to agree to stop the kind of deceptive practice noted above. The more complex the system, the more organizations shuffling money and paper around, the less transparency there is, and the more opportunities it seems there are to make money via deception. A unit of Medtronic defrauded Medicare of hundreds of millions of dollars, according to a civil lawsuit that was unsealed Thursday and simultaneously settled with the Justice Department. Two insiders had said Kyphon, which Medtronic acquired in 2007, improperly persuaded hospitals to keep people overnight for a simple outpatient procedure to repair small fissures of the spine. Medicare then reimbursed the hospitals much more generously than it otherwise would have for the procedure, which was developed as a noninvasive approach that could usually be done in about an hour. By marketing its products this way, Kyphon was able to artificially drive up demand among hospitals, bolstering its revenue and driving up its stock price. Medtronic subsequently bought the company, its competitor, for $3.9 billion, greatly enriching Kyphon’s senior executives. The settlement requires Medtronic to pay the federal government $75 million plus interest, and to enter into a 'corporate integrity agreement' with the Office of Inspector General of the Department of Health and Human Services. The agreement will require the company to give correct advice to customers about how to apply for Medicare reimbursements. The company will also have to set up internal procedures to make sure it complies with the law. One former worker, Craig Patrick, said bosses ignored his warnings in 2005 that the practice amounted to fraud. 'It's my opinion that this was a very organized strategy from the beginning to make these inpatient cases, so facilities could afford the expensive kits and Kyphon could be very profitable,' he said in an interview. After he warned supervisors at Kyphon, he was denied a promotion and told he 'wasn't a team player,' Patrick said. He left the company in 2005, after filing the suit, and now works for another medical device maker. 'The whole thing played out like a cliched movie you'd see about a whistle-blower,' he said. This is becoming all too drearily familiar. We have all the usual elements: a clever, but deceptive plan by a health care organization to increase its profits, while incidentally driving excess medical care; an internal skeptic who is derided as "not a team player," and thus forced to become a whistle-blower; and eventually, an investigation and then a settlement that probably failed to recover all the costs incurred by the health care system, certainly did not reverse the excess care provided; and may not be sufficient to deter some clever but dishonest health care executive from coming up with the next version of this scenario. One would think that were a segment of the health care industry to be "fraught with allegations of bribes, exaggerated claims, and other unethical behavior," the result would be not only outrage but some systematic efforts to combat these abuses. Instead, this particular case so far has inspired not a single pundit to view it with alarm, and there still seems to be no systematic efforts ongoing to combat "bribes, exaggerated claims, and other unethical behavior." It's the anechoic effect, as usual. But politician and policy makers keep scratching their heads when confronted with ever increasing health care costs, ever declining access, and stagnant quality. And as we have noted before, the usual approach to these problems seems to focus on cutting physicians' payments, and imposing new guidelines and quality standards, usually starting with primary care. What's wrong with this picture? a contract with extremely restrictive terms that the university signed in 2006 to do research for Philip Morris USA, the nation’s largest tobacco company and a unit of Altria Group. The contract bars professors from publishing the results of their studies, or even talking about them, without Philip Morris’s permission. If 'a third party,' including news organizations, asks about the agreement, university officials have to decline to comment and tell the company. Nearly all patent and other intellectual property rights go to the company, not the university or its professors. Virginia Commonwealth’s guidelines for industry-sponsored research state, 'University faculty and students must be free to publish their results.' The guidelines also say the university must retain all patent and other intellectual property rights from sponsored research. Under the agreement, though, Philip Morris alone decides whether the researchers can publish because the contract defines 'without limitation all work product or other material created by V.C.U.' as proprietary information belonging to the company. 'These restrictive clauses seek to protect the rights and interests of multiple parties in the agreement,' Dr. Macrina said, pointing out that Virginia Commonwealth scientists would be working with other researchers. Dr. Macrina also defended the requirement that the university decline comment and tell the company if asked about the agreement by news organizations and other third parties. 'Language like that occurs in agreements like this because the sponsor wants to be sure there are no slip-ups, that things will not be released inadvertently,' he said. Dr. Solana also said the contract represented a new focus on developing tobacco products with reduced risks, a shift in strategy in underwriting university research that requires more confidentiality to protect the corporation’s intellectual property rights. And he said Philip Morris had similar arrangements with other universities — although he declined to say how many or which ones. saying that once the company determined that its competitive interests were protected, it could permit researchers to publish. What's wrong with all this? Where do I start? First of all, the fundamental mission of the university is to seek and disseminate the truth. Letting a research sponsor control whether research can be published, and making secret research agreements with research sponsors violate this fundamental mission. Perhaps under some special circumstances, such as when national security is involved, exceptions could be made. But obviously doing research for a tobacco company does not involve national security. It is painful to see a university vice president for research verbally squirming to try to justify signing a contract that so fundamentally violates the university's mission. Second of all, the research was being done on behalf of the interests of a tobacco company. There is no doubt that smoking cigarettes leads to severe health risks, and has never been shown to provide any important health benefits. It has been shown by others that tobacco companies seek to have academic institutions do research on their behalf to give their selling of hazardous products a cloak of respectability. For a university that includes a proud and venerable medical school (formerly the Medical College of Virginia, and, for the purposes of full disclosure, a medical school on whose faculty I served for seven years), to help a tobacco company gain such a cloak violates the fundamental health care mission of the school, in my humble opinion. At Virginia Commonwealth, few professors appeared to know about the contract; when told about it, a number of them said they were concerned about its secretiveness. 'It’s a controversial area, and I personally prefer transparency,' said Richard P. Wenzel, chairman of the department of internal medicine at the university’s medical school, who had not heard of the contract before a reporter’s call. As we have noted before, often the leaders of academic medical institutions seem to make the pursuit of money, prettied up as "external funding," their highest priority. Thus do the high ideals of academia go up in smoke. ADDENDUM (26 May, 2008) - See also comments on the Clinical Psychology and Psychiatry blog. On the Carlat Psychiatry Blog, Dr Daniel Carlat discussed the Physician Payment Sunshine Act. This proposed legislation would mandate disclosure by drug companies of all payments over $500 made to physicians for speaking, consulting, travel, etc. Dr Carlat, however, noted an important loophole. The legislation would not cover payments made to medical education and communication companies (MECCs) to put on continuing medical education (CME) activities. Pharmaceutical, biotechnology and device companies often sponsor CME produced by MECCs. Such CME, even though it may be accredited, may be done more for marketing than educational purposes. But payments to physicians by MECCs made with money supplied by industry would not need to be disclosed according to the present form of the bill. Dr Carlat fears that the legislation, in its present form, may have the unintended consequence of promoting even more industry-sponsored (and industry-friendly) by MECC provided CME. On the GoozNews blog, anonymous blogger "PM" discussed a set of guidelines written last year on the prevention of operative bleeding. The guidelines endorsed aprotinin to reduce bleeding despite concerns raised in a 2006 New England Journal of Medicine article. Subsequently, several studies showing increased risks of mortality for patients receiving the drug, and it is now off the market. PM wondered whether these guidelines enthusiasm related to the financial ties that a majority of authors reported with Bayer, the company that made aprotinin? On the Bioethics Forum, see these comments by Karama Neal. Google Health has been getting a lot of buzz for making some sort of personal electronic health record available to the masses. Too bad that, as Neal noted, "it makes sales pitches from pharmaceutical companies part and parcel of medical decision-making." Apparently the software was designed to provide advertising pitching products relevant to a particular patient's condition to a physician looking at that patient's Google Health record. So in signing up for Google Health, patients are also signing up to help drug, biotechnology and device companies hawk their wares to physicians. The Wall Street Journal just reported on the "makeover" of Novartis. Part of that makeover was the appointment of a new leader for the company's pharmaceuticals division. Joe Jimenez was running Novartis's consumer health-care business and had spent most of his career at packaged-goods companies, including H.J. Heinz Co., before Dr. Vasella tapped him to revamp Novartis's pharmaceuticals as the division's new chief. Mr. Jimenez, the pharmaceuticals chief, started four pilot projects in tough markets to try to improve Novartis's relations with payers. In the Pacific Northwest, Novartis is trying to develop closer relations with an HMO by paying to train its nurses in some aspects of heart disease. Mr. Jimenez calls this 'key account management,' similar to a packaged-goods company trying to improve its relationship with a retailer. 'That tends to help your business over the long term,' he says. As we have often noted, the movement to break up the physicians' "guild" and hand power in health care over to managers often has meant handing power over to people with little background or experience in or knowledge of health care (see post here). Thus an executive who used to sell products like ketchup is now in charge not just of pharmaceutical marketing, but apparently of pharmaceutical research and development, manufacturing etc. People who have little understanding of what health care is about are not likely to make decisions that will improve it. So would you like fries with that ketchup? Hat tip to the WSJ Health Blog, and to Pharmalot. The big Canadian drug company [Biovail Pharmaceuticals] agreed Friday to plead guilty to U.S. kickback and conspiracy charges. The decision, which closes out a federal investigation of the company's unusual actions in support of a 2003 drug launch, means Biovail (BVF) and a New Jersey-based subsidiary will pay a $24.6 million fine to avoid a court case that could have cost them future business with federal agencies. The marketing program in question - Proving Cardizem LA through Clinical Experience, or PLACE - aimed to build physician awareness of Biovail's 2003 launch of a crucial product, the long-acting formulation of heart drug Cardizem. Skeptical hedge funds and research outfits charged that by paying doctors up to $1,000 for prescribing the drug for up to 15 patients, Biovail's program amounted to little more than bribery. Note that, as reported by Bloomberg, the payments were meant to be for "research,"
Biovail's plan [was] to offer them $1,000 to write 15 prescriptions for Cardizem LA, then complete a report on each patient. Biovail, the U.S. attorney's office wrote in its press statement Friday, 'did not design or implement the PLACE program in a way calculated to provide new or meaningful scientific data about whether Cardizem L.A. worked better than other available drugs.' It added in settling charges against the company that the payments to doctors exceeded the 'reasonable fair market value' of the physicians' services. Add this to our collection of grossly unethical financial interactions between health care organizations (in this case, a pharmaceutical company) and physicians. In this case, payments apparently meant to serve as inducements for physicians to prescribe a drug were prettied-up as research support. Pharmaceutical, biotechnology, and device companies now spend vast amounts on payments to physicians. These include payments for "consulting," "honoraria" for speaking, "royalties" for use of intellectual property, and funding for "research." Rarely do the companies or physicians involved disclose the amounts paid, or what the physicians did in return for these payments. One can only wonder how many other such payments are really for physicians' prescribing particular products, or helping to market these products. Only full disclosure of all payments made to physicians, other than fees for clinical services, could put such concerns to rest. I would implore my fellow physicians who take payments for "consulting," "honoraria," "royalties," and "research" support to fully disclose these patients, their amounts, and what the physicians have done for them. If such disclosures might seem embarrassing, then the affected physicians should consider whether they should be taking such payments at all. Similarly, the organizations making such payments ought to fully disclose the people getting them, the amounts, and the reasons for the payments. Again, if such disclosures seem embarrassing, then the companies should consider whether they should be making such payments at all. Physicians rightly often complain the they are being deprofessionalized. Being professional involves subscribing to and upholding a clear code of ethics. A major element of physicians' ethical codes is putting the interests of individual patients first. Taking payments to prescribe particular products, rather than prescribing for individual patients those drugs which are most likely to help, and least likely to hurt those patients, appears to violate this prime ethical directive. Physicians deprofessionalize themselves when they take payments or gifts in return for prescribing specific products. If we do not want to be deprofessionalized, we must not take actions that deprofessionalize ourselves. Commercial Managed Care Organizations "Will Not Sacrifice Profitability for Membership"
The nation's largest publicly traded health plans say they don't plan to temper premium increases for the sake of keeping members on their rolls -- particularly not while they are under pressure from Wall Street over what it sees as their disappointing earnings. Wall Street analysts were shaken over the long-term prospects of the health plan business after bellwethers WellPoint and UnitedHealth Group, the nation's two largest private-pay plans, reported less-than-expected profits from the first three months of this year. But health insurers say cutting premiums or reducing the rate of increase to keep customers would affect their bottom lines more than losing some members over premium hikes. 'We will not sacrifice profitability for membership,' WellPoint President and CEO Angela Braly told analysts during a conference call. In addition, consolidation gives health plans negotiating power over physician reimbursement, thereby driving down medical costs. In trying to persuade investors that WellPoint's problems are 'fixable,' CEO Braly emphasized WellPoint's market power, which she said gives it the ability to lean hard on its network doctors to accept lower reimbursement. Contrast WellPoint's "miserly" approach with its stated "commitments,"
Commercial managed care organizations love to tell the public how they seek to make care more affordable and increase access. But obviously these objectives pale when compared with keeping the profit margins healthy. Contrast also WellPoint's "miserly" approach to making health care "affordable," and it emphasis on boosting its profit by cutting payments to physicians, with the compensation given to CEO Braly. According to the company's 2008 proxy statement, her total compensation in 2007 was greater than $9 million. Finally, note that Wellpoint's efforts to control health care costs seem only to encompass cutting payments to physicians. It's curious that big, for-profit managed care organizations and health insurers seem much more inclined to target physicians, rather than other sources of rising health care costs. But then again, those other sources are all big organizations, such as hospitals and health care systems, and pharmaceutical, biotechnology, and device companies. It's a lot easier to target physicians, who are unable to negotiate collectively with the MCOs, than to target other big corporations with lots of negotiating muscle. Such financial relationships may influence the MCO not to be too tough when negotiating prices of the goods and services provided by the sorts of organizations the MCOs board also directs. We continue to protect our margins. ... We are committed to sustaining a quality business without taking shortsighted pricing positions. Contrast this with UnitedHealth Group's new and improved mission. * We work with health care professionals and other key partners to expand access to high quality health care so people get the care they need at an affordable price. (For the old mission, see this post.) Again, telling the public about "affordable" health care is one thing, but protecting the bottom line without taking "shortsighted pricing positions" comes first. And that will, of course, help Mr Helmsley's bottom line, which was over $13 million in total compensation for 2007, according to the company's 2008 proxy statement. We have often criticized pharmaceutical, biotechnology, and device makers for deceptive marketing approaches. But the continuing insistence by commercial managed care companies that they are out to provide the public with "affordable" health care seems to be equally thickly sliced baloney. Physicians and patients need to be continually skeptical of the claims made by the marketers of all large health care organizations. Furthermore, they need to be alert for conflicts affecting the leadership of such organizations that may influence them to turn from their warm and fuzzy stated missions and ideals. ADDENDUM (23 May, 2008) - see comments by DrRich on the Covert Rationing Blog. We often post about conflicts of interest affecting physicians, other health care professionals, and generally those who make decisions about health care. A rather bizarre kerfuffle has developed in Massachusetts over a proposed legislative ban of gifts by pharmaceutical and biotechnology firms to doctors. Taking aim at Senate President Therese Murray’s proposed ban on drug firms’ gifts to doctors, the head of GlaxoSmithKline’s U.S. operations is accusing Massachusetts of a 'strong anti-biopharmaceutical streak' and bemoaning attempts to 'attack and demonize' the industry. Christopher A. Viehbacher, president of U.S. pharmaceuticals for the British-based Glaxo, sent harshly worded letters earlier this week to Murray, Gov. Deval Patrick and House Speaker Sal DiMasi, suggesting his firm might not invest as much in Massachusetts if 'political developments' work to 'devalue' its assets here. To hear the industry tell it, the Free World would lose access to the Band-Aid if that were to happen. 'Strictly interpreted, the `anything-of-value' ban could bring clinical trials to a halt in Massachusetts, severely cut into necessary and mandated continuing educational studies undertaken by physicians and mean that fewer new medicines are readily available to patients in the state that is the global hub of medical innovation,' the Massachusetts Biotechnology Council wrote in a May 1 letter to state legislators. Sen. Mark Montigny, who authored the gift-ban provision, said the legislation would not harm medical research, and the Life Sciences Initiative itself is proof the state is not opposed to the biopharmaceutical industry. The bill also expressly allows for doctors to continue receiving free drug samples from the manufacturers. It's clear that some people in pharma and biotechnology are greatly opposed to any interference with their ability to give physicians pens, coffee mugs, free meals, etc. They failed to explain how in the world such gifts promote clinical trials, or are necessary for continuing medical education. That at least one company executive would stoop to threatening to take the company's business elsewhere suggests how important some leaders in pharma and biotech believe these gifts are. In the absence of any good argument that the gifts promote patient care, education or research, presumably what some company leaders really value is the gifts' marketing effects. However, that is all the more reason for physicians to rethink why they have been accepting such gifts. "An Impending Hurricane of Outrage" About the RUC? We have posted a number of times, (most recently here, and see links to earlier posts) about the RBRVS Update Committee's (RUC) responsibility for Medicare's relatively poor payments for primary care and other "cognitive" physicians' services, compared to procedures. This imbalance has rippled through all of US health care, affecting how private insurers and managed care organizations reimburse physicians, and generally how the US systems favors procedures over talking, examining, thinking, diagnosing, prognosticating, deciding, and prescribing and super-specialization over generalism and primary care. The RUC ostensibly is just an advocacy group sponsored by the American Medical Association, yet it seems to be the only source of outside input about physicians' reimbursement used by the US Center for Medicare and Medicaid Services (CMS). Given this influence, it is dismaying that it is secretive, unrepresentative, and unaccountable. Neither its membership nor proceedings are public. It is dominated by proceduralists and sub-specialists. It is unaccountable to US physicians, much less the general public. We therefore recently commented skeptically about how CMS put the RUC in charge of setting physicians' payments for the patient-centered medical home (PCMH). The PCMH seems to be a newly fashionable concept for reviving primary care. It turns out a lot of other medical and health care bloggers were equally skeptical. In this post on the e-CareManagement Blog, Vince Kuraitis describes physician bloggers as "spewing venom" at the idea of the RUC determining how the PCMH might work. He linked to five blogs other than Health Care Renewal (and the Happy Hospitalist, to whom we linked in the post above), and then noted "you can add me to the list." His final question was, " Are these reactions just a few lone bloggers, or the first whispers of the impending hurricane of outrage? I suspect the latter." response, academics performed 4 controlled trials during the 1990s. None favored chelation, but chelationists repudiated those findings. We have investigated the method and the trial. We present our findings in 4 parts: history, origin and nature of the TACT, state of the evidence, and risks. We present evidence that chelationists and their organization, the American College for Advancement in Medicine, used political connections to pressure the NIH to fund the TACT. The TACT protocols justified the trial by misrepresenting case series and by ignoring evidence of risks. The trial employs nearly 100 unfit co-investigators. It conflates disodium EDTA and another, somewhat safer drug. It lacks precautions necessary to minimize risks. The consent form reflects those shortcomings and fails to disclose apparent proprietary interests. The trial's outcome will be unreliable and almost certainly equivocal, thus defeating its stated purpose. We conclude that the TACT is unethical, dangerous, pointless, and wasteful. It should be abandoned. You may be asked to "register"; don't worry, it's free. The article is very long, but the Introduction, Executive Summary, Discussion, and Conclusion are reasonably succinct and make the important points. Readers who want to learn more details, who want to see more evidence for our assertions, or who are compelled by an odd fascination with crackpotism (my own weakness) will want to read more. I've posted a similar announcement on Science-Based Medicine. "I hope that some day you get your wish"
The HISTalk site, a popular, vendor-supported health IT "gossip" site, has a different standard for its reader comments than HC Renewal, allowing anonymous ad hominem and other forms of hysterical or irrational argumentation to be posted without refutation by the site owner. In a way, this is good, because such posts may reveal sentiments held by a number of people but rarely expressed, except in an anonymous forum. ... the “wisdom” that pervades your posts is a sense of victimhood…that the high failure rates in IT (please acknowledge that medicine has a 100% failure rate at keeping people alive for their desired lifespan) are due to the mystical idea that physicians have been forced to depend on IT experts to assist them with IT issues. So, physicians and others who speak out on HIT issues in the interest of patient care are merely expressing "victimhood" (this does not seem to reflect very good reasoning), and the other statement about medicine's 'failure rates' is at best some odd, irrelevant comparison (akin to "a hundred dollars is a good price for a toaster, compared to buying a Ferrari.") I cannot even parse the meaning of the final passage in the comment. Hmm - a non-practicing MD who, despite a long list of what he deems essential but unfairly ignored industry credentials, can’t seem to hold a job for very long? He’s not doing informatics physicians any favors with his whining diatribes that always end up congratulating himself for his own wonderfulness. I’m sure that’s why he can’t stand the idea of a CIO getting and holding a job based on accomplishment instead of argumentative resume-brandishing. We should be hearing from those out there getting the work done, not loudmouth bystanders. Ironically, in the very same blog which generated the discussion thread is a link to the story of the New Zealand hospital whose IT debacle nearly killed people and caused a senior physician there to tell the press the hospital "could not guarantee patient safety." While I sincerely hope the views I reposted above are a minority in the health IT world, they are reminiscent of feedback people who write about HIT problems receive, and not always anonymously (e.g., Ross Koppel's study on CPOE being called "disingenuous" by those with industry interests). They are certainly consistent with views I saw displayed as a CMIO myself by some MIS department staff, often in behind-closed-doors chatter by people who forgot that "in hospitals, the walls have ears." Someone should please tell me why clinicians would want people of such anti-intellectual views and/or poor reasoning skills to be anywhere near systems upon which patient care depends. We get it. You would like for clinical IT specialists to be escalated to positions of leadership. That sounds great and I hope that some day you get your wish. "We", I imagine, refers to non-clinicians in HIT, and I can only imagine this statement was made without much enthusiasm. Finally, I want to make the point that I find the resistance in IT circles towards leadership of clinical IT by qualified biomedical informatics professionals quite puzzling. It's not as if the latter want to run the entire IT shop including business IT, just provide leadship in clinical IT. It's a true win-win situation, after all. CIO's and other IT personnel get reduced job stress and perhaps longer tenures due to the expertise and presence of a cross-disciplinary intermediary between clinicians and IT (it's been said that in healthcare, CIO="career is over", as average job tenure is just a few years). Biomedical informatics professionals get to leverage their expertise and the sacrifices they made in pursuing additional training. The healthcare system benefits from improved HIT and less costly HIT errors, difficulties and failures. And last (but certainly not least), patients benefit. We previously discussed an article by Jeanne Lenzer and Shannon Brownlee in Slate The article discussed a show broadcast on many US National Public Radio (NPR) stations which portrayed a rather benign view of the side-effects of anti-depressant medications. Not revealed to listeners was that the show was partially funded by a company that manufacturers such medication, and all the participants in the show had some financial relationships with such companies. We suggested that the audience deserved to know about such conflicts of interest, and that had the show's producers felt compelled to reveal them, maybe they would have thought twice about not including without such conflicts. As discussed on the Hooked: Ethics, Medicine and Pharma blog by Dr Howard Brody, Lenzer and Brownlee were both deluged with requests from journalists for this list of unconflicted experts, but also by somewhat ominous demands for the list by people who may be tied to the pharmaceutical industry. Brody noted that it is not unheard of for industry to try to intimidate people it feels are hostile to its interests. (For some of our posts about related cases, look here and here.) He concluded, " industry appears to feel threatened by this list in a way that is quite unprecedented and unexpected. How and why that is so is worth pondering." Stay tuned on this one. This story has caused a stir in the New Zealand press: bad health IT creates mayhem. I fear such events are far more common in healthcare than we know, publicity only occurring when someone goes to the press (often at risk to their career, unfortunately). It appears this hospital went out of its way to violate just about every concept presented in the biomedical informatics literature about the potential risks of clinical IT when developed and managed by non-clinicians. Bad health informatics can kill, but doctors shouldn't worry about it. As in my posts here and here, doctors can't understand IT because they're too consumed with patient care issues, the rate of change of IT is too fast for their limited minds, and a degree doesn't get you anything, anyway. The IT leaders from the School of Hard Knocks will make it all better, real soon now. The Ministry of Health is to investigate claims from a senior doctor that Grey Base Hospital cannot guarantee patient safety because of a systems failure. Dr Judy Forbes, joint head of the anaesthetics department, wrote to the West Coast District Health Board with her concerns about a month ago, and addressed the board in person for three minutes at its last meeting. A copy of a letter written after that meeting has been leaked, and another Grey hospital doctor says it is "entirely factual". Dr Forbes' letter makes a number of allegations, and raises concerns about the "endless stream" of locums. Dr Forbes said some patients had been put on the surgery list for the wrong procedure with the wrong anaesthetic. Other allegations included patients receiving appointment letters the day after their appointment, a knee replacement patient receiving a letter for a dental procedure, a patient on the list for a two-hour procedure having it done in another hospital six weeks earlier under contract with the West Coast board and a patient given the wrong medical advice by IT staff to stop medications without clinical consultations. In another alleged incident, an elderly woman admitted for an incarcerated hernia was sent home for a day or two, awaiting equipment from Christchurch. She contacted the booking office a month later as she still didn't have an appointment. Dr Forbes, who has worked at Grey Base Hospital for 15 years, said most of her time recently was spent "fighting fires". "In addition to working with an endless stream of locums, surgeons and anaesthetists with unknown skill and experience, I am often the only New Zealand-qualified doctor involved in the patients' care and thus responsible for the outcome." She also alleged patients were often seen by the surgeon for the first time in the anaesthetic room. Dr Forbes told the board the hospital didn't meet the Health and Disabilities Service consumers rights code. Fellow Greymouth anaesthetist Dr Susie Newton said today the letter was "entirely factual". To which I can add, I wouldn't have entirely believed it were it not for the fact that I've seen even worse endangerment of patients by bad health IT with my own eyes. As a result of my posting "Earthlings and Htraesians: The Parallel Worlds of Medicine and Healthcare IT", a discussion has started on the HISTalk blog. That discussion thread can be seen in the comments section here. I have seen many people get hired into IT with degrees in everything from Zoology (really) to other non related fields. Their degree offers no value to the position or the job at hand. I think a physician is no more qualified to run IT than a CIO is qualified to perform brain surgery. I believe in a good mix of clinicians and technical experts makes the best combination on implementation teams. However, running an IT department is completely different than running a medical practice. Physicians who believe they can lead IT in healthcare are as misguided as CIOs who think they can design the perfect EMR. PS - I am a PhD in Information Science and do not presume to cross the line into medical practice. "Physicians who believe they can lead IT in healthcare are as misguided as CIOs who think they can design the perfect EMR?" That non-physicians cannot practice medicine (i.e., "CIO's not qualified to perform brain surgery") is axiomatic and irrelevant to the argument. However, to say a physician cannot practice something outside of medicine is a non sequitur (at best). Has the writer spoken to each and every physician, once-physician, retired physician, physician informaticist, physician MBA, and every other physician on the planet, I ask part tongue in cheek and part dead seriously? The CIO with medical credentials is as rare as hen's teeth, but as I have pointed out in the past, this is not a symmetrical affair. This is especially true in the culture of medicine, where when the opportunity arises, physicians seek additional education (e.g., in healthcare informatics). What has led to such stereotypical thinking in our society where physicians are concerned? I find the phenomenon alarming, for I encounter it at least as frequently (if not more) than I did when I wrote this piece - a decade ago! - on stereotypes about physicians and IT. Importantly, I believe this and related stereotypes about physicians are a driver and an enabler (either through genuine belief or through disingenuous opportunism) of much that ails medicine today through the interference of non-medical outsiders. The fundamental message is that physicians are children who cannot do anything more than medicine, and require "a village" of paternalistic non-medical outsiders to manage their affairs. It appears you just stereotyped physicians, who often have significant predoctoral and other experiences beyond medicine, especially those who’ve pursued graduate and postdoctoral training in informatics. It it in part through such stereotyping, resulting in the exclusion or marginalization of needed cross-disciplinary domain expertise, that health IT runs into expensive, unnecessary difficulty, or fails. However, you have not stereotyped CIO’s regarding inability to perform neurosurgery, unless that CIO has an MD and training and boards in neurosurgery. I am a physician, practiced internal and occupational medicine, so I would appear to fall under your statement. My minor in college was computing, right up to IBM 370 assembler, and I began computing years before college via unfettered access to a hands-on DEC PDP-8/S and an HP-2000C timesharing system (1970-1974) and via a Heathkit H-8 I built in medical school for clinical-related experiments, 1978. Also built an infrared-sensing heart monitor in my elective in biomedical engineering at BU School of Medicine. I am also a Radio Amateur, licensed by the FCC at the highest (Extra) class after examination in electronics theory and radio laws. That background is not entirely atypical for those in medicine who are interested in IT. Please evaluate my other background items in my online bio, for example, and then tell me why doctors are “unqualified to run IT.” As an information scientist, it should be easy for you to locate that bio. Understand your comments. I meant to imply, but failed to say, physicians without IT training or CIOs without medical training. You might add that in a follow up comment. The problem has become one of stereotypes that are then used (either through genuine belief or disingenuous opportunism) for purposes that serve no one, including patients! And in fact, the clarification was indeed soon added as a follow up comment by the poster. This was a very thought provoking post. After I cooled down a bit I could certainly appreciate your views as true taken from a certain perspective. Let’s shift that perspective a bit. Consider the nature of the two disciplines with regard to formal education. As a field of study, medical practitioners have the advantage of hundreds of years of collegiate tradition and lexicon with some fundamental concepts so well ingrained into the profession that most TV viewers can rattle them off with ease…breakdowns of anatomy, diagnoses, methodologies, pedagogical structures like “rounds” etc…all substantially similar over decades or hundreds of years. A key difference in the IT realm is the shear pace of change within the mind-space. Obviously, technological advances in medicine cause rapid change, but I would suggest to you that the speed and scope of changes in IT far outpace and outreach those in medicine. Here is a hypothetical example: A computer scientist who achieved doctoral-level credentials at a college in the late 1970s would have worked primarily in an environment of mainframe computing, focused on centralized data processing using procedural programming languages or machine-level code. ... I would further suggest that the limited value of formal education that we often purport is due to the fluidity of change in the area of concern. My IT training was accomplished through self-study. I have a music education degree and a Master of Healthcare Administration and I serve as an IT director for a health plan. I also have a professional certification in information security and I will no-doubt continue to seek further education as I go. However, consider this: My education included an alphabet soup of languages/skills that I don’t use anymore in my daily work. You are going to have a hard time convincing dedicated IT professionals that their lack of a rigid educational achievement indicates that they are not viable contributors because the pace of change thwarts all such efforts. I value the input of my medical staff and our business directors for the value that they bring (oddly enough, it hadn’t occurred to me to question or even examine their credentials) and I hope that they judge my value primarily on the basis of their interactions with me and the results that we achieve together. I value "my" medical staff? For the "value they bring" -- in a healthcare setting, no less? Those phrases alone are revealing about the paternalistic and patronizing attitudes at the heart of the IT-medicine cultural divide. Such ossified views are also characteristic of what I've described as a power inversion in healthcare such that control by its enablers (clinicians) has been usurped by its facilitators (non-clinicians such as IT personnel) to the point that the latter feel they are absolutely entitled to the leadership role. In effect, the worst aspects of the IT culture are being inflicted upon the medical profession, and due to their relatively good nature and political naiveté, medical professionals are sitting ducks. A Hospital CEO Censors the Internet, Only to See "the Handwriting on the Medical Chart"
The waiting room reeked. Along a crowded hallway, patients lay in beds, with only a thin curtain for privacy. Nurses readying for a new case in surgery noticed blood, bone and globules of fat on the walls and floor and stuck to wheels of carts. They were greeted last year at an overburdened emergency department where the staff could be robotic and hardened to patients. Sometimes, inexperienced nurses evaluated the sick and suffering. Some patients were shuffled to a stifling back room to wait. Medical records, crucial lab results -- even patients -- got lost. Staff didn't notice when one Alzheimer's patient walked home in 100-degree heat. Another patient was dismissed because doctors didn't get lab results indicating a life-threatening disease. The trauma center was described as a war zone. Operating rooms as chaotic. In too many places, instruments were broken, rooms dirty, linens threadbare. These problems sound unfortunately typical of an impoverished public hospital system trying to care for even more impoverished patients. But there were several twists to the story. The first is that hospital system executives were instrumental in setting in motion the discovery of these problems, but they then apparently first tried to ignore what was discovered. [The reports] were never presented to the JPS board. The Star-Telegram recently obtained a copy. When [JPS Health Systems CEO David] Cecero was asked about the reports' findings, he said he couldn't answer: He hadn't read the documents or been briefed on them. JPS board Chairman Steve Montgomery said he was unaware of the InSight Advantage study until the Star-Telegram raised questions about it. Then he asked for a copy. The second twist is that while the reports painted a picture of a (sadly not atypically) impoverished hospital system trying to take care of even more impoverished hospital patients, the Star-Telegram claimed that JPS was far from impoverished. Boosted by tax funding other local hospitals don't get, JPS has been racking up fat surpluses -- nearly $97 million last year alone. But the cash has not helped a dedicated core of doctors and nurses overcome the system's callousness, ineptitude and filth. JPS is a hospital that many of its own doctors wouldn't recommend. In the past six years, Tarrant County property taxpayers have anted up $1.3 billion on the premise that the mission of the public hospital is to treat the indigent and needy. But a four-month Star-Telegram examination found that the Hospital District has squandered opportunities to improve care and compassion as it has chased insured patients pursued by every other Tarrant hospital. As trash cans overflowed, so did the district's bank accounts. The district's investments swelled to $381 million last year, earning $22 million in interest. But nurses scrambled during surgeries for instruments that low-paid assistants couldn't identify. Over five years, JPS grabbed $232 million from one federal program for the poor, and administrators said they banked much of it. Meanwhile, needy Tarrant County residents sometimes waited months for appointments, and others went without care because they could not afford the co-payments. Net income at JPS Hospital has quadrupled since 2001, and the hospital's investment funds have more than doubled. The nonprofit hospital in 2006 achieved a healthy 16 percent return on equity, the common measure of a hospital's profitability. In comparison, Harris Methodist Fort Worth earned a return on equity in 2006 of 7 percent. Since 2001, JPS has aggressively pushed up its retail prices, outpacing the rate of increases at eight other Texas hospitals that the Star-Telegram examined. Seven years ago, the hospital's retail price was $1 for every 73 cents in costs, according to reports that JPS filed with the federal government. By 2006, JPS was charging $1 for about every 28 cents in costs - a markup of 257 percent. This strategy may have been designed to increase Medicaid reimbursement. JPS officials are frank about saying that the increases were driven by the opportunity to maximize Medicaid revenue, and they don't apologize for that. As JPS' burden of charity care has grown, and as the federal government has clamped down on rates Medicaid pays, administrators say they have had to strategize ways to draw more money from supplemental government funds. Unfortunately, the higher the "rack rates," the higher the bills faced by uninsured patients, patients who are likely to be poorer than insured patients. Chief Financial Officer Gale Pileggi says that she is aware the higher charges hurt some people and that the hospital is trying to deal with the dilemma. JPS board Chairman Steve Montgomery said hospital officials have told him that few people charged at the full rate actually pay the entire bill. 'It's what truly helps me sleep at night,' Montgomery said. But at many hospitals, some patients do get slapped with the highly inflated retail rate, said Glenn Melnick, a hospital pricing expert at the University of Southern California in Los Angeles. About 5 to 10 percent of all hospital patients are asked to pay the full retail price, he said. 'One of the biggest implications of these rising charges is that while they were driven by hospitals trying to increase their revenue from Medicare and Medicaid, they have this very nasty effect of generating highly excessive prices for the uninsured,' Melnick said. In addition, the high charges undermine people's faith in hospitals and healthcare, he said. But JPS employees won't be able to read the rest of the series online - not at least while they are at work. JPS Chief Executive David Cecero and Chief Financial Officer Gail Gale Pileggi decided to block internet access to the Star-Telegram.com site. 'It was a decision that was discussed with the administration, being Mr. Cecero and Gail Pileggi, and how to deal with news issues and how many people have the right to read and do things during the work day,' said JPS spokesman Robert Earley, senior vice president of public affairs and advocacy. Despite JPS' censorship, dozens of blog postings on the stories were made by people identifying themselves as JPS employees. JPS Health Network CEO David Cecero was surprised by the board decision on Wednesday to cut ties with him, it's only because he refused to read the handwriting on the medical chart. County taxpayers will have to pay him $775,268 whether he leaves his office tomorrow, on Sept. 30 or at the end of July 2009, as the terms of his negotiated leave-taking call for. The district might be in the best financial shape it's ever witnessed, but the core mission of providing care to an expanding universe of indigent patients has suffered in the process. Meanwhile, the story also showed when bad news appears, the first impulse many health care executives now have is to ignore it, their second, to censor it, but not to deal with its cause. Once again, I will argue that to put patients first, we need to make the governance of health care organizations, starting with not-for-profit hospitals and academic institutions, more representative of key constituencies, accountable, transparent, and subject to clear codes of ethical conduct. Hat tip: Schwitzer Health News blog. The information we used in those posts about the payments came from lists posted on the internet by the five companies. The lists were posted under deferred prosecution agreements a US Attorney made with four companies (Biomet, DePuy Orthopedics, Smith & Nephew, and Zimmer Holdings) and an agreement allowing federal supervision of Stryker Orthopedics. The companies were charged with violating anti-kickback laws by paying orthopedic surgeons as "consultants" to use their products. The lists on which I based the above posts contained data from nearly all of 2007. When I reviewed the 2007 lists, I was struck by how many doctors, academic institutions, and other not-for-profit organizations were on the lists, and how much money some of them received. The potential for payments of hundreds of thousands or millions of dollars to influence the thinking and actions of these people and organizations was obvious. Many of the orthopedic surgeons involved were prominent practitioners or academics. The likelihood that their practice, teaching or research might have been influenced by financial entanglements of this magnitude was obvious. Similarly, the likelihood that large payments to academic institutions or professional societies might influence their actions and policies was also obvious. But, two of these lists are now lost in cyberspace. So those wishing to use them to inform their thinking about the people and organizations involved are out of luck. Whether by the end of the year the 2008 lists will essentially provide the same information as the 2007 lists is unknown. Even if they do, the loss of the 2007 lists will make it difficult to determine whether the financial relationships revealed in 2008 were new or not. Furthermore, erasing the 2007 data would obviously reduce the perceived overall magnitude of some of the financial relationships. In summary, erasing the 2007 data off the internet suggests that the companies want to provide as little transparency about their payments to orthopedic surgeons, academic institutions, and professional societies as possible, and that the companies want to minimize perceptions of the magnitude and duration about these financial relationships. We are only making slow progress in making the web of financial entanglements that pervades health care more transparent. ADDENDUM (12 May, 2008) - As noted in the comments, the 2007 information from Biomet was apparently recently added to the list available on the web. It now begins after item 168, thus apparently truncating the 2008 data for recipients starting with names beginning with alphabetically after "Wo...." Also, Smith & Nephew has also loaded its 2007 information, apparently completely.